President Donald Trump continues to beat the drums of war, and the media are going along with him. Trump doesn’t have any particular incentive to bomb North Korea or advocate for regime change in the country. It’s not even clear that Trump knows the leader of North Korea’s name. But Trump is above all a man who likes to be liked. And so far, the actions that have won him the most praise have been when he dropped a bunch of bombs on Syria. And just as we saw in the lead up to the second Iraq War in 2003, American military action will begin to feel inevitable. Talks about diplomatic options will be brushed away with “we tried that” and there will be no other course but war. Then come the slogans: These colors don’t run. Love it or leave it. 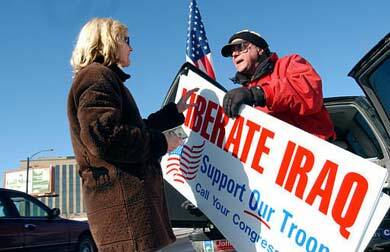 Liberate Iraq. Or, in this case, Liberate North Korea. And no matter how many times you insist that while you would love to see Kim Jong-un ousted yet don’t want to see war, you will be called a naive traitor—maybe even that greatest of insults, unAmerican—who doesn’t understand how the real world works. Can North Korea strike the US? Again, this might be a good time to pause and think about your feelings on North Korea a few months ago. Was the country an existential threat to you then? If you’re feeling more inclined to support a preemptive war against North Korea, as Trump has said is now a very real possibility, what changed? Was it reading an article that said North Korea could one day, possibly, maybe hit the United States with a nuclear weapon? An easy win against an inferior enemy? If tensions between the U.S. and North Korea reach the point where America uses its mighty air power against the rogue nation, it won’t be much of a battle, experts told Fox News. If that strength includes U.S. airpower, North Korea’s antiquated Korean People’s Army Air Force (KPAAF) wouldn’t be able to put up much of a fight. If you’re old enough to remember the invasion of Iraq in 2003, you’ll recall that Americans were also sold on the idea that victory would be easy. Notably, the piece never mentions or considers what happens after you “defeat” an enemy like Iraq or North Korea. Number of mentions of civilian casualties in the Fox News article? Zero. Number of mentions of the inevitable humanitarian crisis? Zero. Number of mentions of the likely counterinsurgency campaign that could last untold numbers of years? Zero. At least we haven’t gotten to the part yet where Americans are being told that North Koreans will welcome us as liberators. They said that about Iraq, and it turned out to not be the case—in a very major way. In North Korea, every person is taught from childhood that the United States and Japan are the most evil countries on the planet. Something tells me that North Korea’s standing army of 1.3 million troops won’t greet American or Japanese forces as liberators. Even if North Korea’s elite dictatorship were wiped away with a magic wand tomorrow, it’s difficult to predict how the populace would react. In order for the United States to strike North Korea, the Trump regime hypothetically needs buy-in from three places: the international community, Congress, and the American people. When it comes to the international community, Trump has more or less gotten permission to do whatever he wants from allies like Australia and Japan. In fact, Australian Prime Minister Malcolm Turnbull is expected to meet face-to-face with Donald Trump for the first time as early as next week. 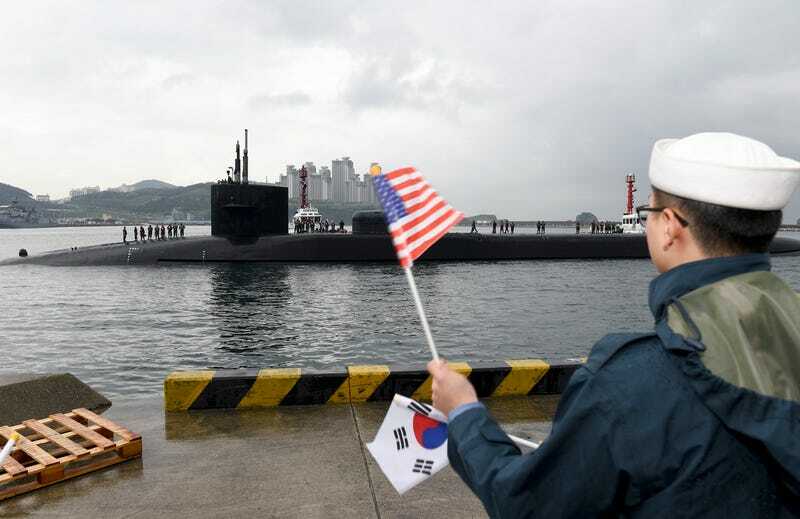 The temporary caretaker government in South Korea doesn’t want war, but it’s easier than ever for Trump to push them around, at least until elections are held on May 9th. And State Department Secretary Tillerson is reportedly charing a special meeting of the UN Security Council on Friday. “The meeting will give Security Council members an opportunity to discuss ways to maximize the impact of existing Security Council measures and show their resolve to respond to further provocations with appropriate new measures,” a State Department spokesperson said yesterday. As for Congress, they’re going to get the hard-nosed sales pitch from the Trump regime this week. All one hundred US Senators are meeting at the White House on Wednesday morning for a classified briefing by Defense Secretary Jim “Mad Dog” Mattis, Chairman of the Joint Chiefs of Staff Joe Dunford, State Department Secretary Rex Tillerson, and the Director of National Intelligence, Dan Coats. A similar briefing is being planned for members of the House. And lastly, there’s the American public, who need to be persuaded that North Korea is a threat to the American way of life through the media. Again, we’re seeing that happening in real time as news stories that are eerily reminiscent of past wars rear their ugly head. I don’t know the future. I have no idea if the United States is going to invade North Korea or drop bombs on Kim Jong-un’s brutal regime. But the stars are aligning this week for a slick sales job, just as we saw in 2003 before the invasion of Iraq. And that should scare the hell out of anyone who believes that the US and its allies have very little to gain and a lot to lose by starting a war (nuclear or otherwise) on the Korean peninsula. The next time you read a story about North Korea or see something about the country on TV, simply ask yourself what changed? Did North Korea become a tangible threat to the safety and security of the United States in just a few short months? Or are you being sold on the idea of a war? If it’s the latter, and you were duped into believing that the invasion of Iraq in 2003 was a good idea, maybe take a moment to reflect on what we’re being sold today. The lives of a lot of people in South Korea, Japan, North Korea and maybe even the US and China depend on what we decide to do next.